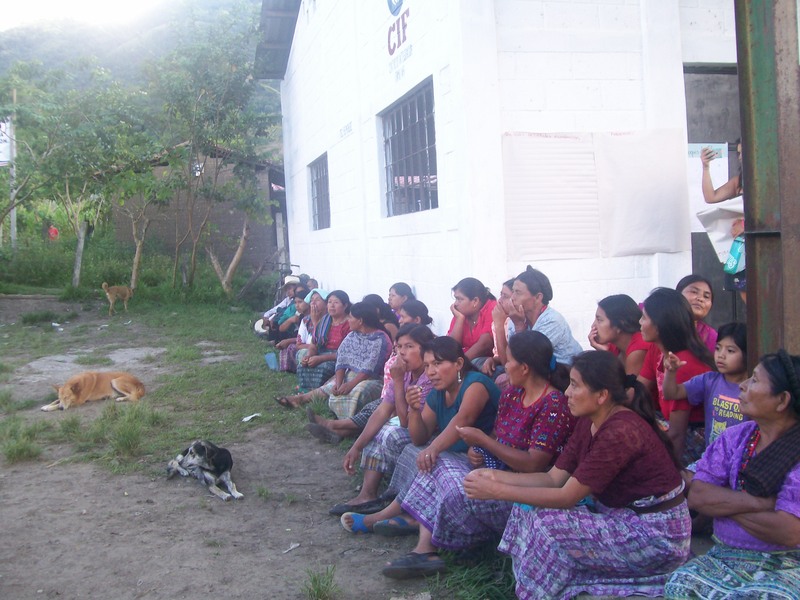 A group of some 50 community members convenes outside the meeting place in Chiac, a rural community about 15 minutes from the center of Rabinal. Usually, such meetings are to discuss the routine goings-on of the community, and often, the turnout is low. Today, however, is different. Community members show up in large numbers, and all arrive early, excited to hear Voces y Manos’ proposal for a community project. Besides the high turnout, there are a few other things that make this meeting unusual. 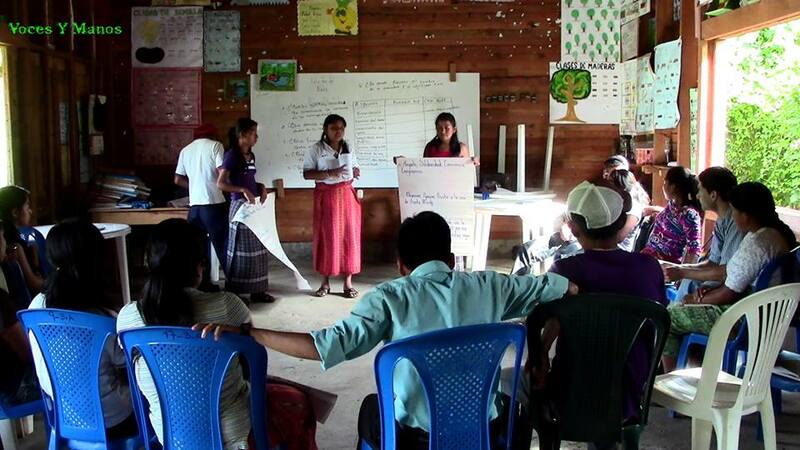 Instead of being led by experts from a local agency, this meeting is almost entirely led by the Voces y Manos youth. In addition, rather than proposing a pre-designed project to the community, the youth explain that they are interested in learning from community members about the project ideas that they believe will be most effective in meeting their needs. The meeting begins with Don José, the elected leader of Chiac, addressing the community with a welcome that begins in Spanish and quickly switches into Maya-Achí. He introduces Armando, Voces y Manos’ program coordinator, whom he describes as an old friend of the community (Armando had worked on several projects in Chiac in his previous job). Armando in turn introduces two of the VyM youth, who explain how the project selection process will unfold. The students—with Armando’s help—explain that they are interested in learning as much as they can about the community before deciding what type of project to design. They split the community members into six discussion groups, each focused on a different aspect of community wellbeing. For the next hour, pairs of students engage community members in a lively discussion about the issues that affect them, such as environmental degradation, poor children’s health, and lack of agricultural land and resources. Thanks to these focus groups, the youth gained a wealth of information about the community that will enable them to hone in on a central problem for their project to address. Yet just as important as the information students gathered from the community was the experience they gained putting their newfound leadership abilities into practice. For the past several weeks, the youth have worked tirelessy developing the skills to be able to facilitate these community dialogues effectively. With a level of skill and tact that surprised even themselves, the youth create a warm and welcoming environment that allowed the community participants to open up and discuss the major challenges they face as as a community. The students’ final project, which consists of interventions into local health, educational, or environmental issues, is the culmination of the youth leadership program. Before they can carry out their community diagnostic or brainstorm solutions, however, the students first have to decide which local community to work with. This week, our main objective was to reach a consensus about where to conduct the final project. Along the way, students developed valuable skills facilitating, negotiating, and teamwork. 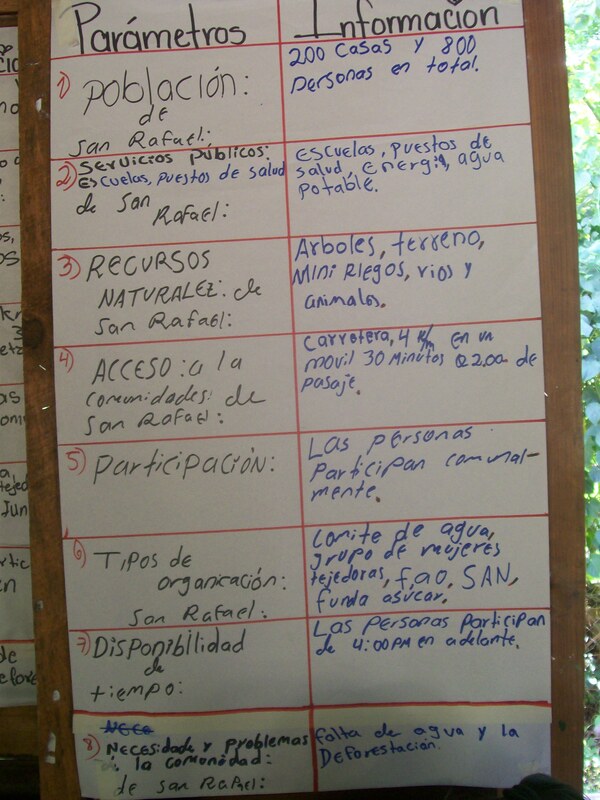 The students began with a list of 8 communities, each home to one or more of the students. 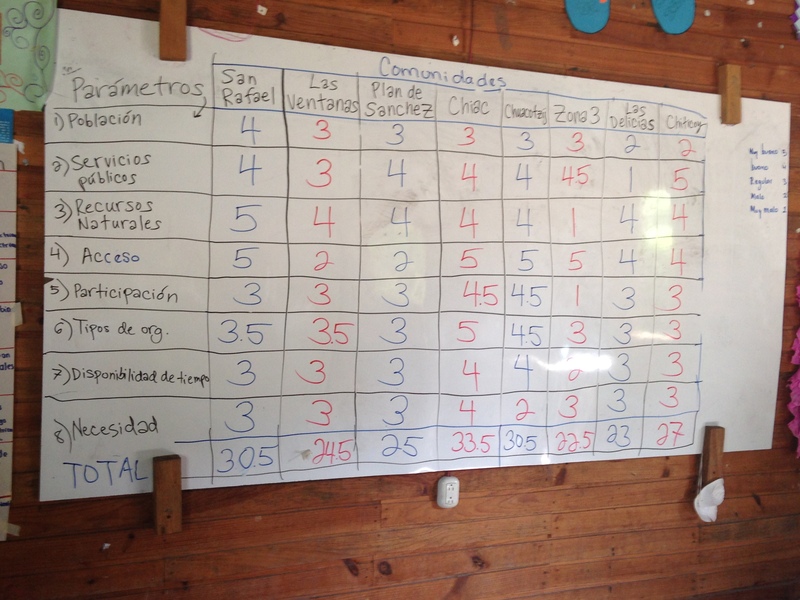 Using a series of parameters, including the accessibility of the community, existing natural resources, strength of community organizations, public resources, and the availability of local collaborators, they ranked the various communities and selected the 3 most suited for the final project. After narrowing the list, the students had to collectively decide which among the three would be the actual place of their community diagnostic and intervention. 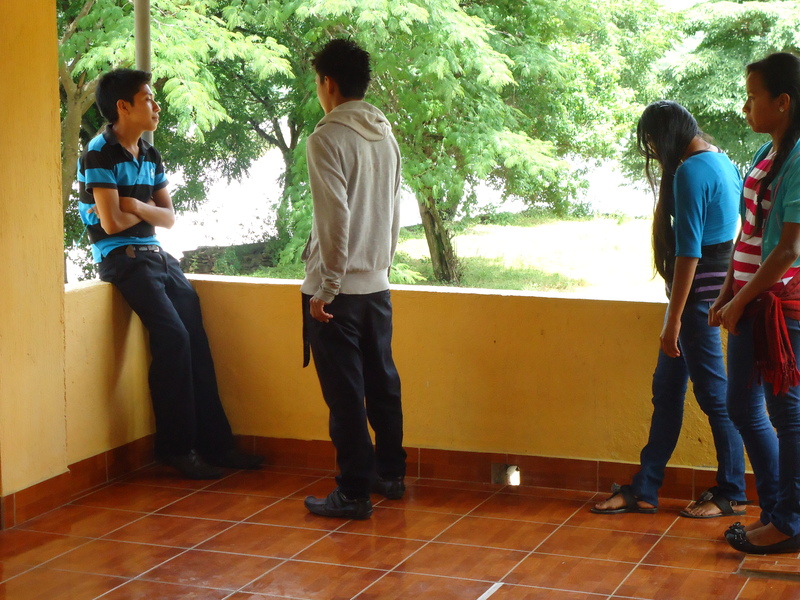 First, Michael and Jeny offered a lesson in group discussion and consensus-building. The students came up with a list of successful and democratic consensus building strategies, such as listening to everyone’s opinion, summarizing the main points, making all participants’ feel welcome to share ideas, and choosing who speaks next based on who raised their hand first. Following the lesson, two student facilitators led the group discussion and worked to ensure that everybody’s voice was heard. Students offered impassioned pleas and reasoned arguments for why one community rather than another was the ideal site for the final project. Drawing on the consensus-building techniques and democratic ethos learned throughout the year, the students collectively decided that the local Chiac community would be the site of this year’s community diagnostic and intervention. 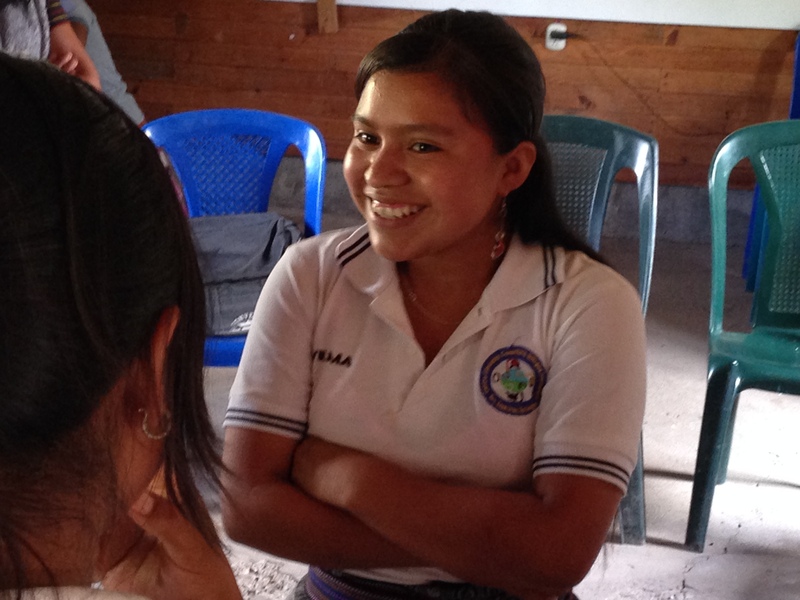 Next week we’ll fill you in on the preliminary results of the group’s first visit to Chiac and the meeting with a local community leader! Dina and Hortencia facilitate the group of students to reach a consensus. 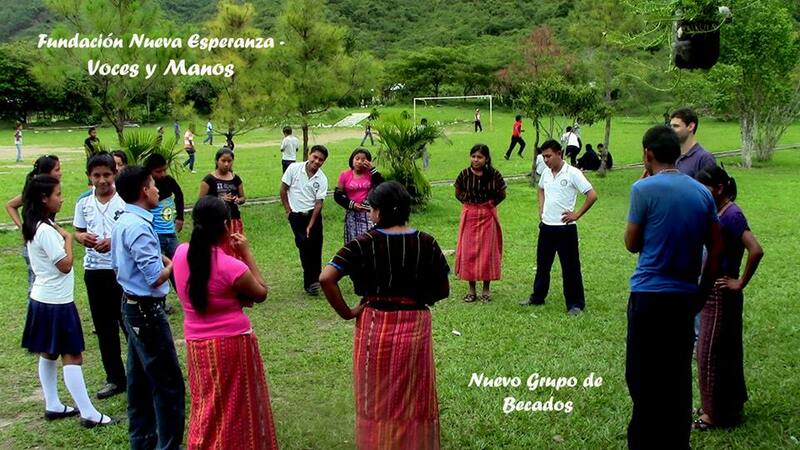 As we’ve mentioned in previous posts, culture plays a central role in Voces y Manos. This year, we decided to embark on a new adventure: helping students to develop videos about their culture, identify, and community. Over the weekend students travelled to their communities, where they recorded interviews with elders. They asked their grandparents and neighbors to talk about the history of their community: How did the community get its name? What are the most important events in the community’s recent history? Students uncovered a wealth of information, which they incorporated into short videos. In addition to interviewing elders, students also shared about themselves in their videos. They talked about their cultural identify, and why it is important to them. They discussed their vision, or the change they hope to see in their communities. And they articulated how they plan to work as community leaders to make that change come to fruition. As always, hard week was broken up with various dinámicas (games). We started the week with a very powerful dinámica in which students stood in a circle, and one by one, shared a strength that they appreciate about one of their classmates. On a more lighthearted note, we also played a game of telephone, an international classic. 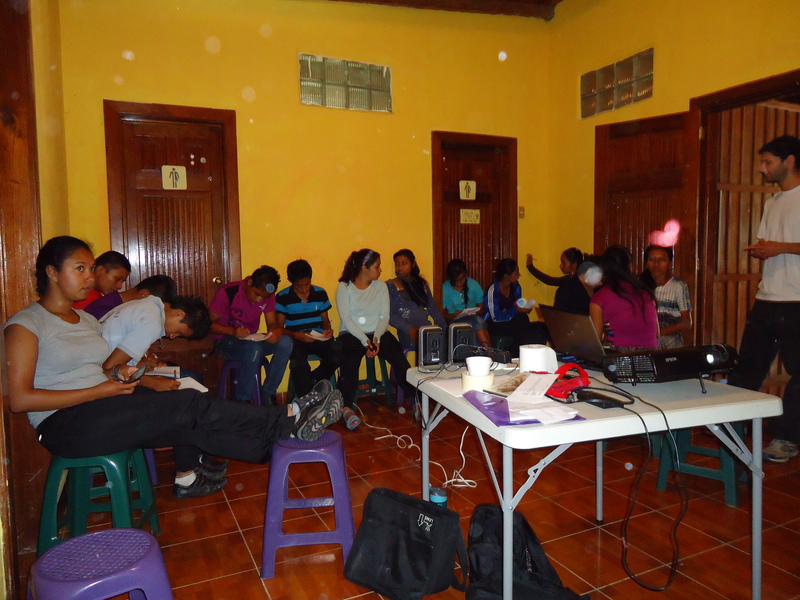 At the end of the week, students presented their videos to a packed audience of students and teachers at Fundación Nueva Esperanza, the students’ middle school. Teachers and fellow students congratulated the presenters on their work. 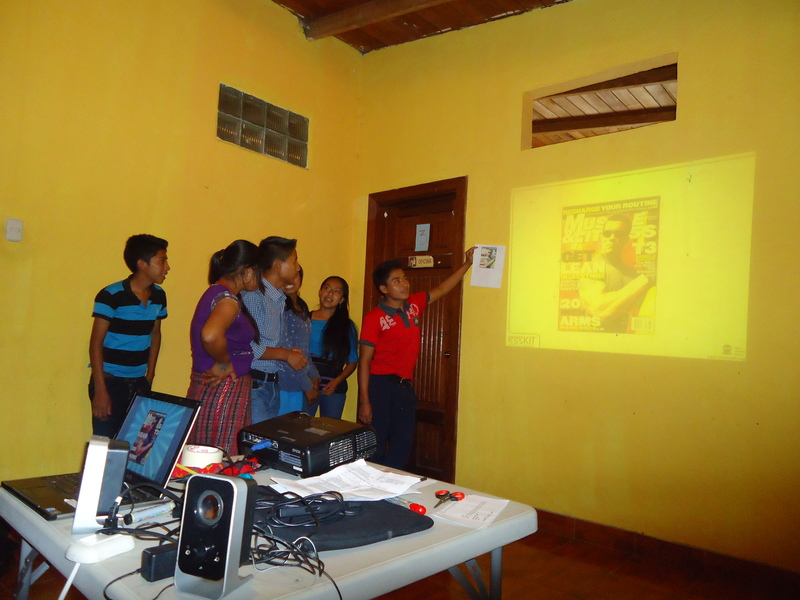 The youth presenters left not only having learned new skills–such as how to use video editing programs–but also with newfound confidence in their communities, and their own abilities to create change. (We are currently working on final edits and sub-titles for these videos, and look forward to sharing them as soon as they are ready to go!) Next week, the youth will harness this confidence to take on their next challenge: developing a community project. 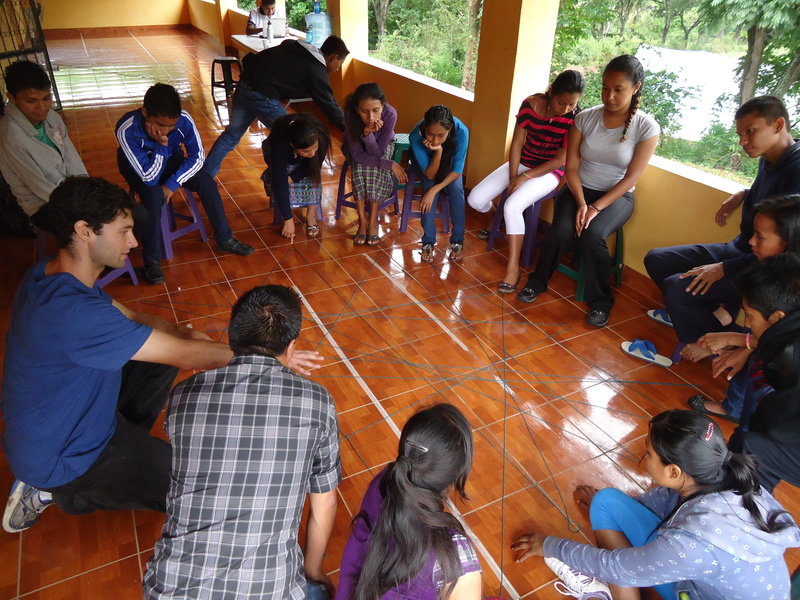 Last weekend, we led a leadership retreat with the group of new scholarship recipients in the nearby municipality of Salamá. We started talking about the 5 guiding values for the program: responsibility, commitment, respect/dignity, solidarity, and honesty, and the students came up with a list of recommendations to follow for the weekend. Above all the students made the commitment to work together as a team and to help one another understand the material. We led the introduction with an activity called “the spider web” with the intention of demonstrating to the students how important it is to work together because if one person lets go of their thread, the entire web falls apart. As they threw the ball of yarn to create the web, each student stated what they wanted to learn during the retreat. After the warm-up activities, we went straight into the main topic; leadership. We began by watching a documentary, Sipakapa No Se Vende, about a Guatemalan community trying to get a Canadian mining company to leave their land. We paused the movie right before the end and divided the class into three groups, each would dramatize an original ending to the movie. The catch: each group was assigned a particular type of leadership style that they had to enact through the skit (autocratic, passive, and participatory leaders). In the end, the students unanimously decided that the only way for a community to achieve its objectives would be through participatory leadership. Here, Jose demonstrates an autocratic leader who only gives orders for others to follow and in the end takes all of the credit. Marlon is representing a passive leader who does not seem to care about the decisions made in his community and does not care to listen to the community’s ideas. 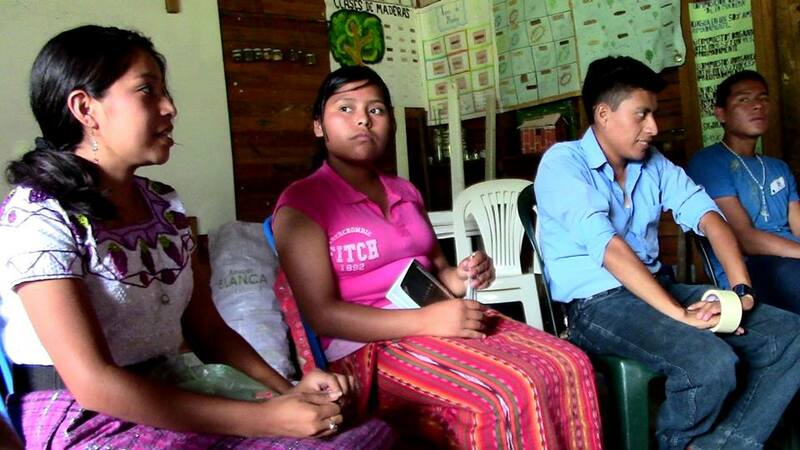 Here, Lorenza, Elson, Lidia, and Mirna get together and share their opinions to confront the big mining company as a group of participatory leaders. After lunch, we shifted topics from leadership to a growing field in education called “critical media analysis.” The aim of critical media analysis is to provide students with tools so that they can become active producers and critics of media, rather than consumers who take media messages at face value. 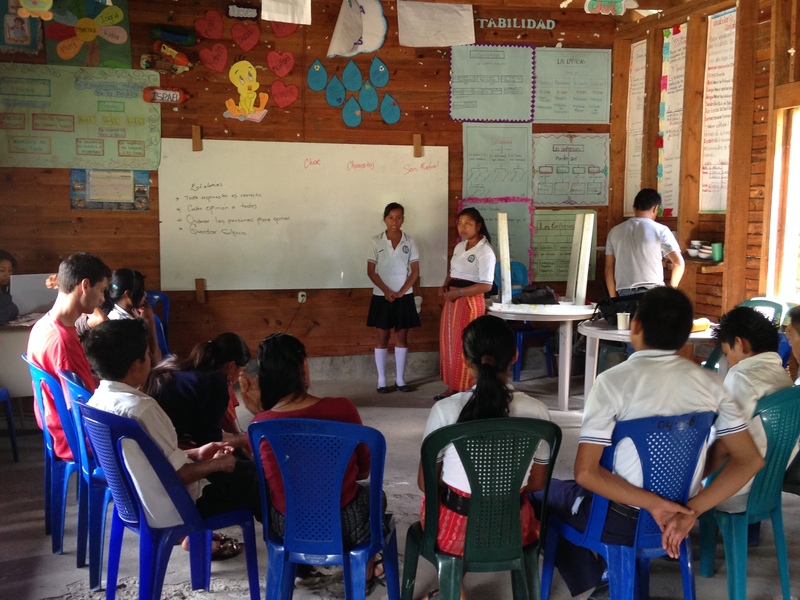 Ultimately, students will make videos in which they represent their own community and culture to an audience of youth in other parts of Guatemala and the world. But to start, we wanted to help students learn to see that media images are not objective portrayals of reality, but rather subjective representations of reality that are designed in very intentional ways to create a particular impression in the mind of the viewer. We started out by providing two groups with completely different images of Arnold Schwarzenegger (one as the terminator, another as the governor). Obviously, the lists of adjectives describing the two Arnolds were quite different, and we challenged students to think of strategies that media-makers are able to use to portray such radically different views of the same person. We then flipped the script by giving each student adjectives such as “powerful”, “weak”, “rich”, or “poor” that they had to represent in a picture of themselves. Students learned to see that there are multiple ways of presenting the same reality, or the same person. None is “right”; all are constructions. The students were given some free time before dinner where they played soccer, braided each other’s hair, listened to music, danced, and had some great conversations. After dinner, we were each given a candle that was not yet lit as we sat in a circle. The way one would light their candle was to get the flame passed to them by another person. 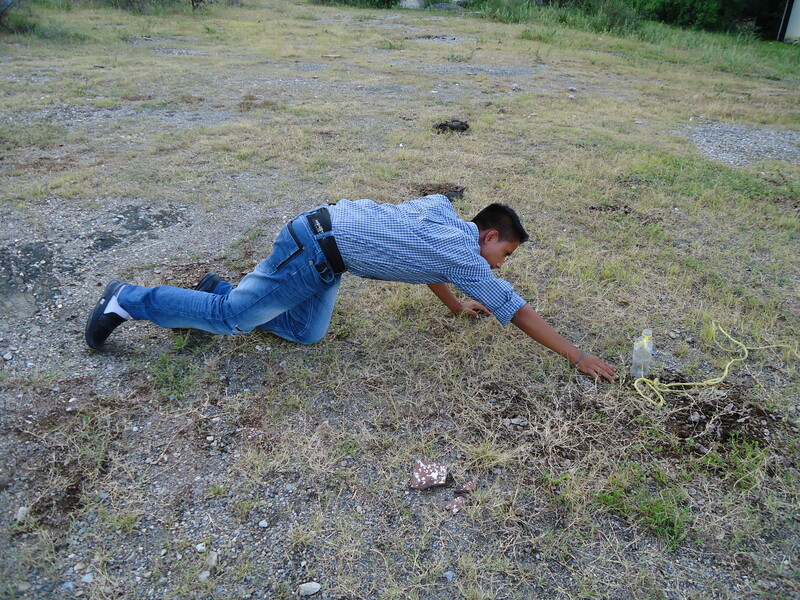 Macario (one of the VyM Program Leaders) started the chain by saying some appreciative words to Michael and the chain kept going until everyone had a lit candle that was used for a bonfire. This activity was used to raise awareness about each individual’s capabilities. The biggest impact was being able to recognize one’s own weaknesses while also realizing that they are able to strengthen them. Another impactful moment was hearing each other’s life experiences, not only because we learned more about each other but also to show support within the group. The students left the retreat as a team, more connected than ever! I have recently graduated from UC Davis majoring in Sociology with an Education minor. Working with Voces y Manos has been a great opportunity for me to gain more experience working with youth and learning about a different culture. Some of my favorite hobbies are playing soccer and hiking, so working with the students in Guatemala has made me feel right at home. 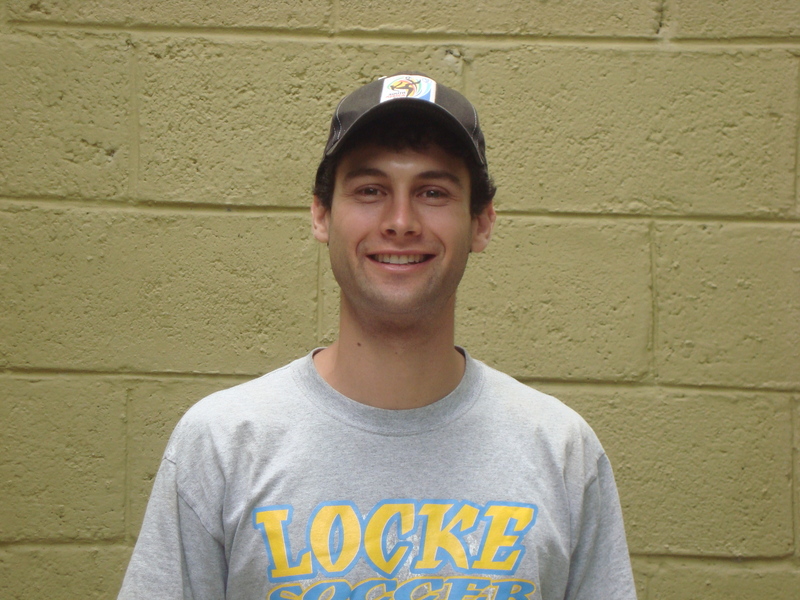 My name is Michael Bakal, and I’m one of the co-founders of Voces y Manos. I recently graduated from UC Berkley’s school of public health. Before that, I worked as a high school science teacher, and spent my summers working on the Youth Empowerment Program here in Rabinal. I’m thrilled to be in Rabinal again for my seventh summer, and am particularly excited to be working with an amazing team of volunteers and staff! Kaj’yup, an ancient ruins located on a small hill overlooking Rabinal, is considered to be the most sacred historical and cultural site of the Achí people (Achí is name for the Mayan group that lives in Rabinal and surrounding areas). 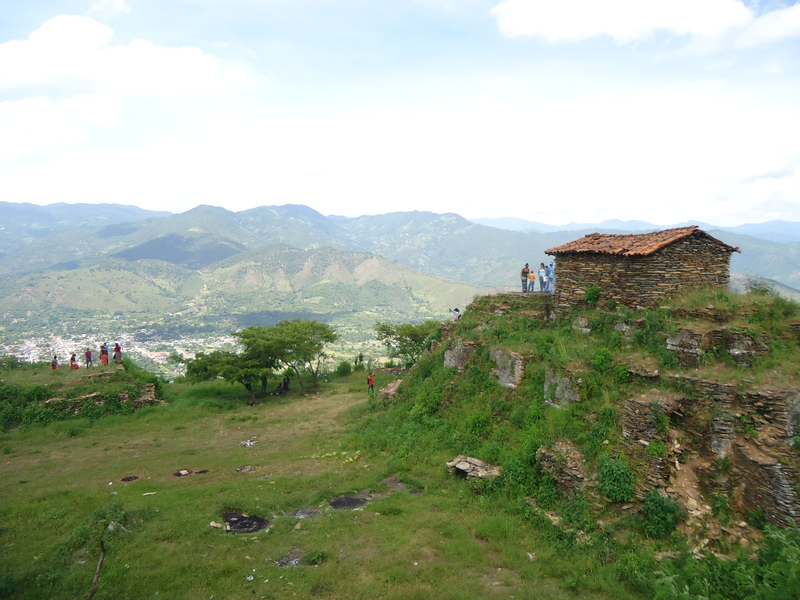 According to oral tradition, Kaj’yup was and is the home of Rabinal-Achí, the once living Achí prince who continues to watch over the people of Rabinal as a guardian spirit. 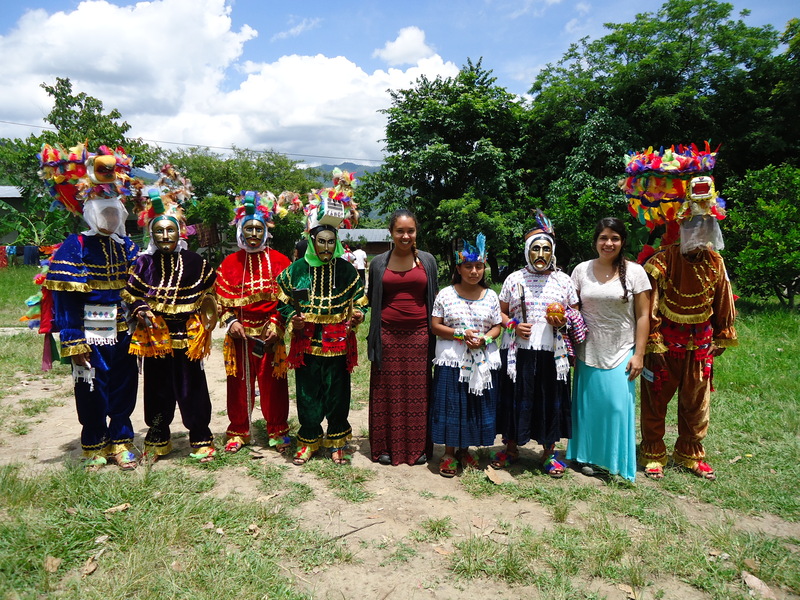 Each year, the entire group of Voces y Manos scholarship students, volunteers, and parents of scholarship recipients travels to Kaj’yup to learn about and practice a traditional Mayan ceremony. 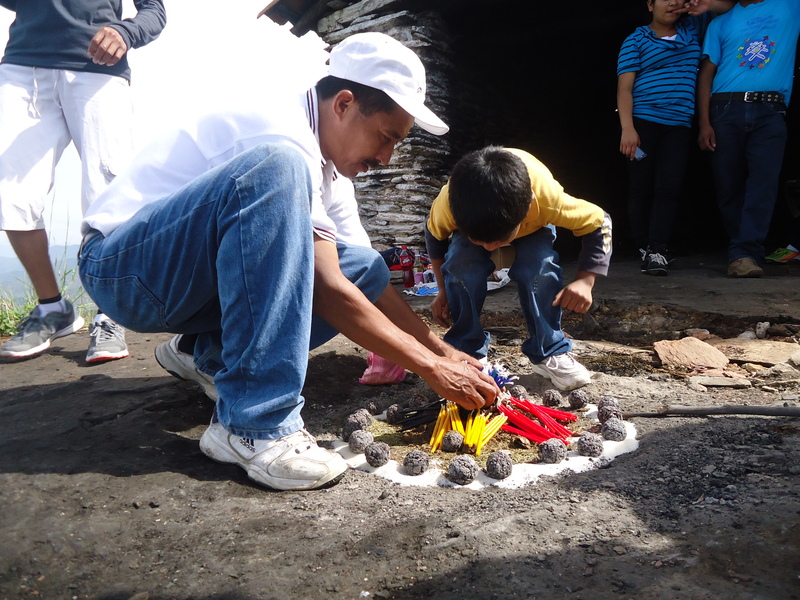 The Mayan ceremony gives us volunteers an opportunity to deepen our understanding of Mayan traditions, it helps students build knowledge and pride in their own culture, and it gives the entire group an opportunity to build relationships outside the context of the classroom. On Sunday morning, we met in plaza of Rabinal at 6:00 am, just as the sun was rising. There, we met up with Manuel, a longtime Voces y Manos advisor who leads the ceremony each year. After a quick head count, we followed Manuel up the hillside to Kaj’yup. The hike took us just over and hour, and when we arrived the sun was high in the sky. 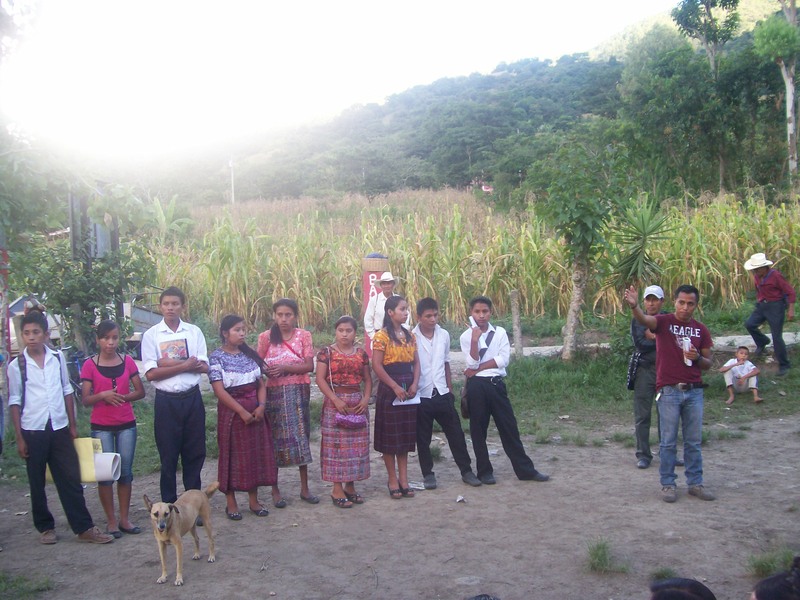 We all drank water voraciously and socialized as we waited for Manuel to set up the materials for the ceremony. Manuel was accompanied by his 6 year old son, Josué, who was at Kaj’yup for the first time. Josue seemed excited to be able to help his dad, and hang out with “the big kids”. The ceremony centered around a small offering which consisted of candles, incense, sugar, bread, sesame seeds, and other items. As the fire burned, the items of the offering mixed together releasing a sweet smell into the air. 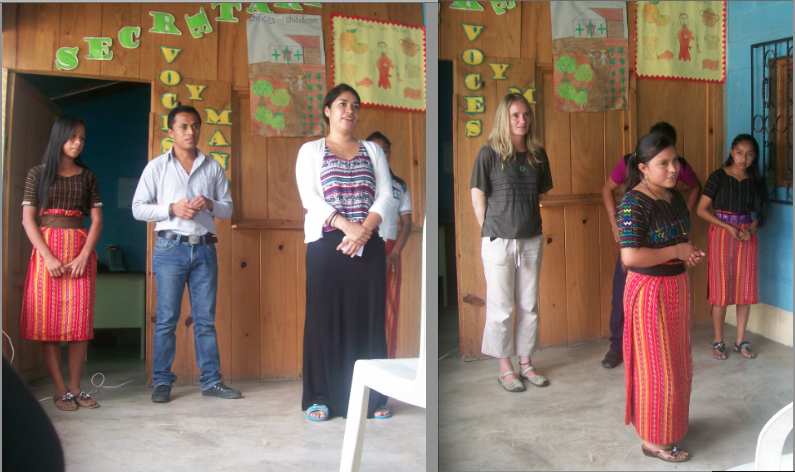 Manuel explained to students about the four cardinal directions that are of great importance in the Mayan tradition. The students turned East, then West, then North, then South, and with each turn, Manuel blew a long, echoing note into a conch shell. As the fire burned down to ashes after an hour or so, students shared reflections with one another about their experience in the Voces y Manos program. Several of the older students welcomed younger students into the program, and mentioned that they were grateful to Fundación Nueva Esperanza and Voces y Manos for the learning opportunities these organizations had provided them. 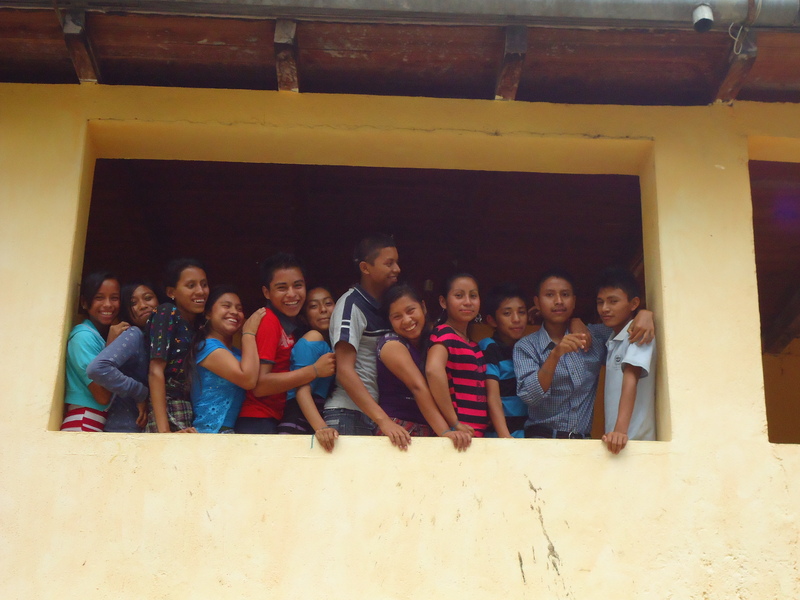 This was the younger group of students’ official welcome into the Voces y Manos family. 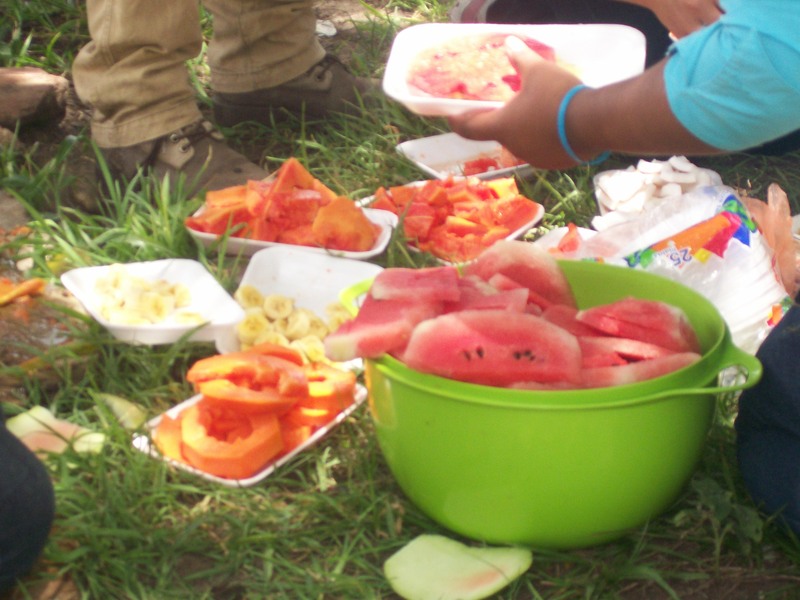 We all thanked Manuel for leading us in the ceremony, then headed down to the the hill to make fruit salad. Each student had brought a piece of fruit to contribute to the salad, and we ended up with a fruit salad that can only be described as epic (quantity as well as quality). It was the perfect way the end the day. We all left the Mayan Ceremony closer and more united as a group than ever before, and ready for the community work to follow in the weeks ahead. Fruit Salad Hit the Spot! 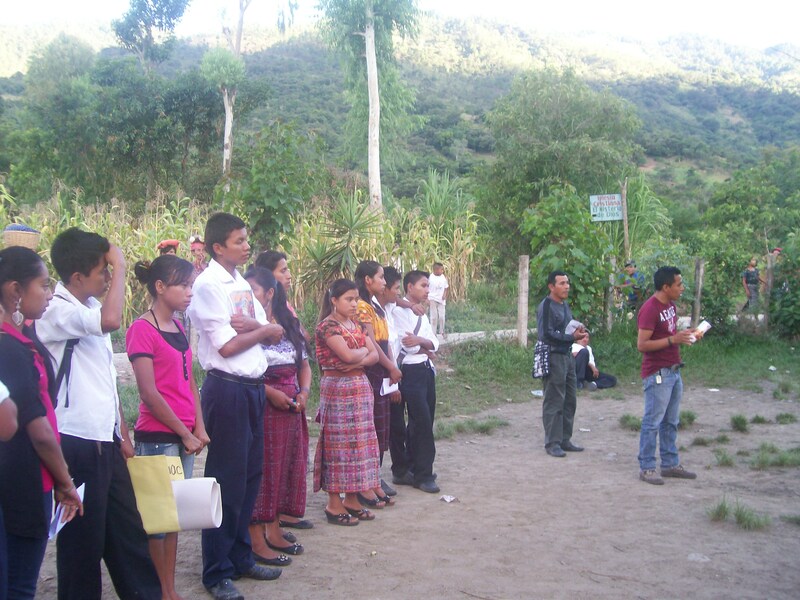 Voces y Manos works to help youth become leaders that will be able to affect change in their communites over the long-run. A starting point for developing this identify as community leaders is a belief in oneself and one’s community. That’s why Voces y Manos begins by teaching youth to recognize the strengths of their communities long before they start investigating community needs. During week 2, we introduced students to a community-assessment known as Photovoice. The methodology is simple: Students are taught how to take photos using digital cameras. They then draw a map of their community, listing as many strengths as they can think of. 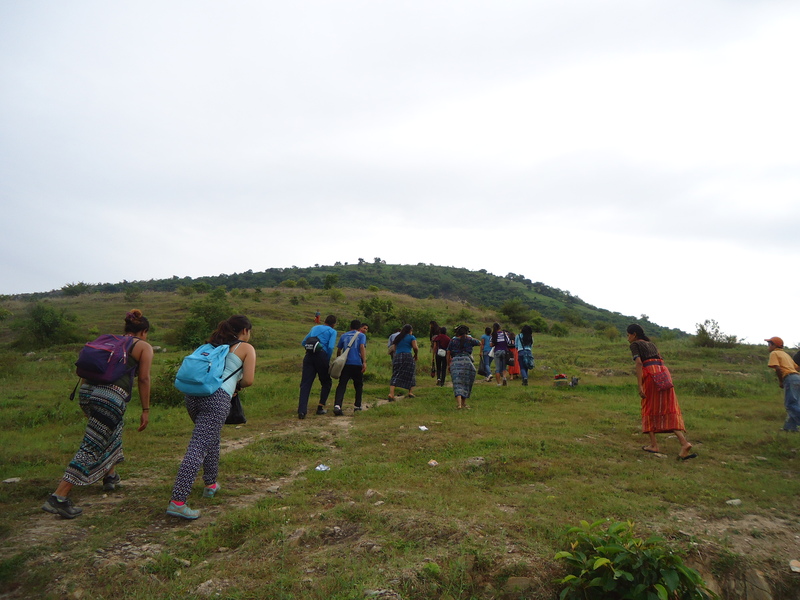 Next, students, accompanied by volunteers, travel to their communities to take photographs of the strengths of their community. They then organize these photographs into a presentation about their community. 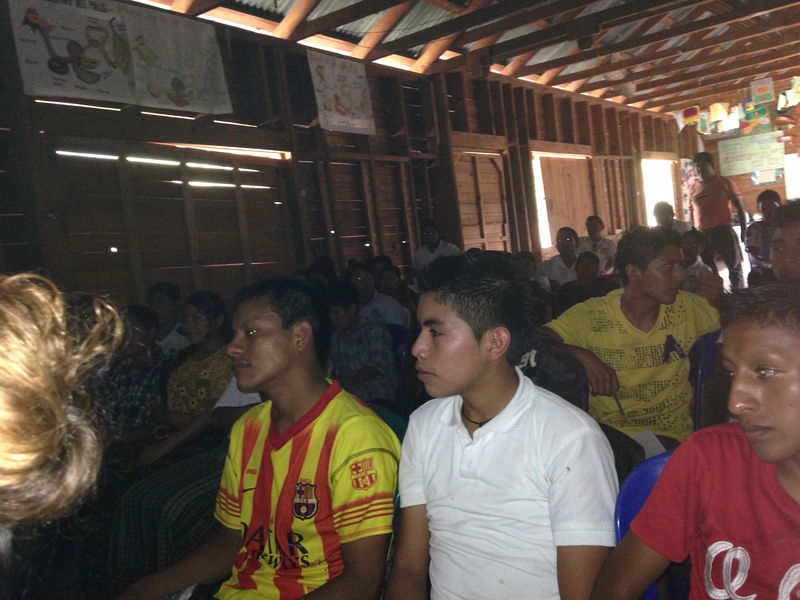 On Wednesday, students traveled in groups of three or four to their home communities. We (the volunteers) were excited to have the opportunity to see students “in their element”, and the students in turn were excited to show us all about life in their communities. Students took pictures of a wide range of community strengths, some that would have completely escaped our gaze: a community clinic, women weaving traditional cloths, people walking to work in the fields, kids playing with each other after school, rivers, trees, and people engaged in conversations. It was fun and informative for all of us. The next day, we worked with students in their school’s small computer lab to select the photos that the students felt best represented their communities. They then wrote descriptions of each photograph, explaining what the photograph demonstrates about their community, why it is an important strength, and how they might be able to use that strength to help improve the community projects they will eventually develop. 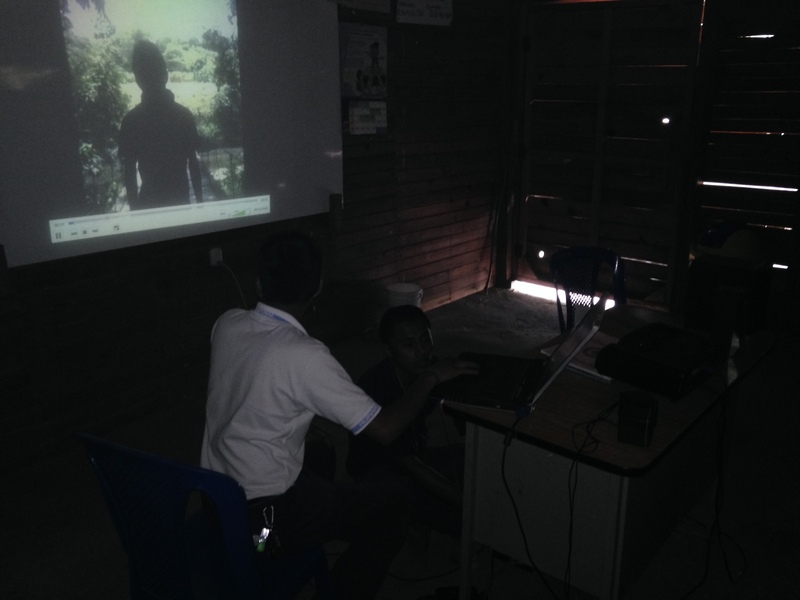 Finally, we introduced students to PowerPoint, a computer program that was new to most of the students. But the students were quick learners, and they quickly learned to copy paste their photos and descriptions into Powerpoint slides. We ended the week with students presenting PowerPoint presentations to one another that documented the entire process. Students thrived as they had the opportunity to share the many strengths of their communities. 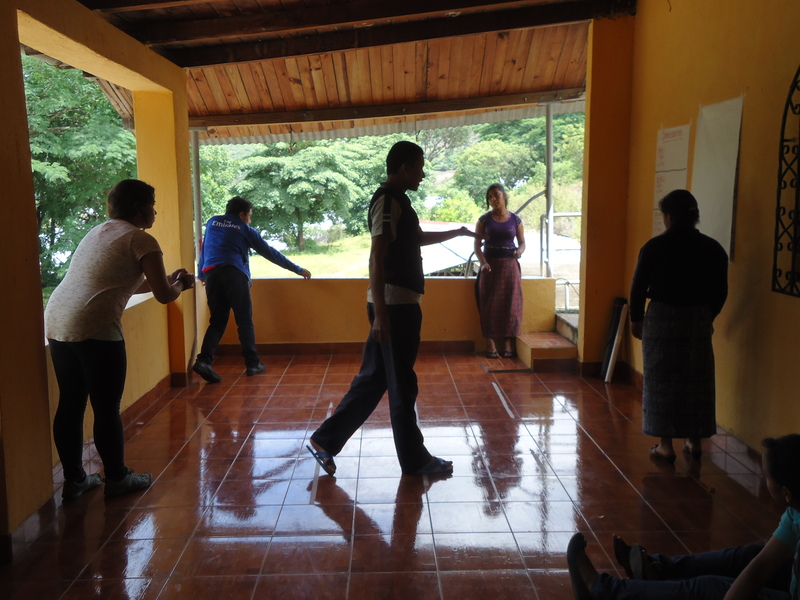 The team of four volunteers–Elena, Shelly, Michael, and Kimberly–arrived to Rabinal during the first week of July where we were greeted with a warm welcome that included a tour of our partner school Fundación Nueva Esperanza, and a student performance of the dance-drama called “Rabinal Achi”. The students, dressed in the traditional costumes of the Rabinal-Achí dance, gave their performance entirely in the Achí language. Afterwords, Prefesor Baudilio, one of the FNE teachers, gave us a translation and interpretation the dance which commemorates an ancient battle between the Achí and neighboring Quiché peoples. In the afternoon, we met the new group of scholarships recipients that we will be working with throughout the summer. Our first session focused on shared values. Without glossing over the differences that make our cultures unique, we discussed the values and beliefs that we all share. Together, we reflected on the importance of responsibility, solidarity, dignity, commitment, and cultural identity, and how we could put these values in practice through the Voces y Manos program. After our discussion of shared values, we started our first unit of the 11-week program: inter-culturality. Volunteers, students, and Voces y Manos staff all brought in cultural artifacts to share that represented their family, community and culture. Students then prepared beautiful presentations for their parents. These parents’ presentations were an opportunity for students’ mothers and fathers to learn about the Voces y Manos program, meet our staff and volunteers, and have the opportunity to celebrate our distinct cultures which make us unique, yet at the same time, bind us all together. There´s Something about Culture. 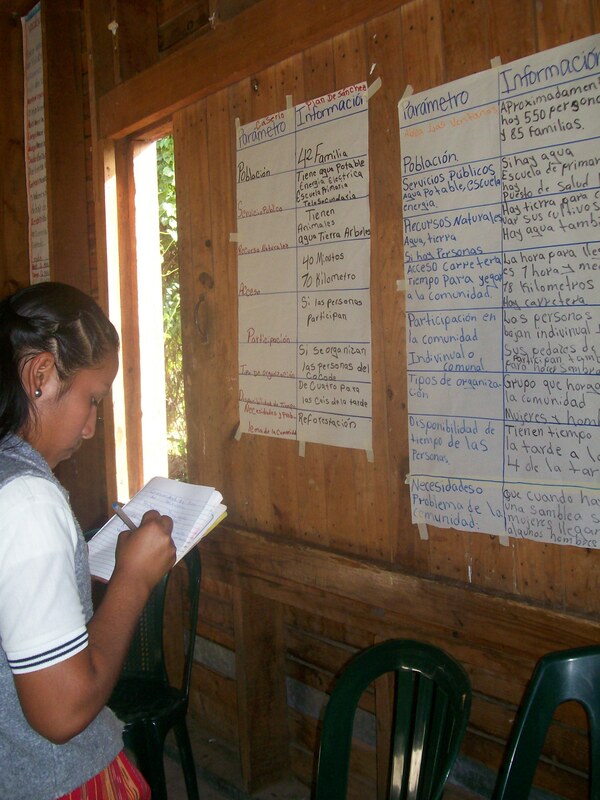 . .
Five large sheets of poster paper are taped to the walls of the classroom, each containing a single word: Honestidad, Respeto, Solidaridad, Convivencia, or Compromiso. 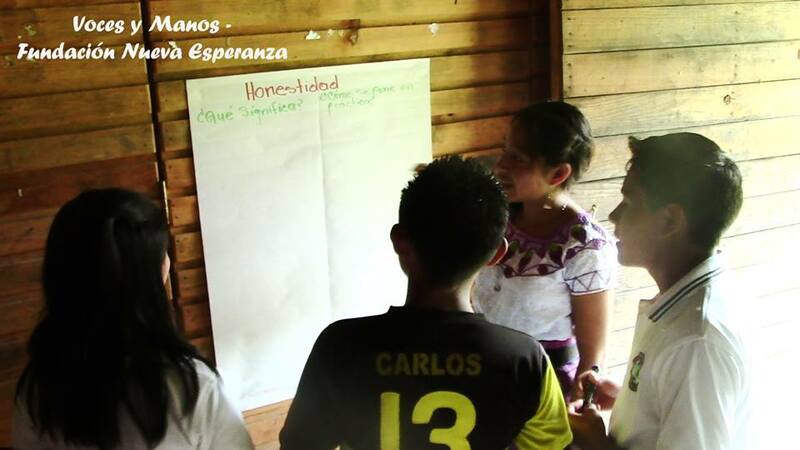 Each word represents a core value in the Maya-Achi culture (Honesty, Respect, Solidarity, Community, and Commitment). Students walk around the classroom silently, and write short descriptions on each poster of how these values are relevant in their lives, their families, and their communities. A recent conversation with a friend/mentor provided answers. 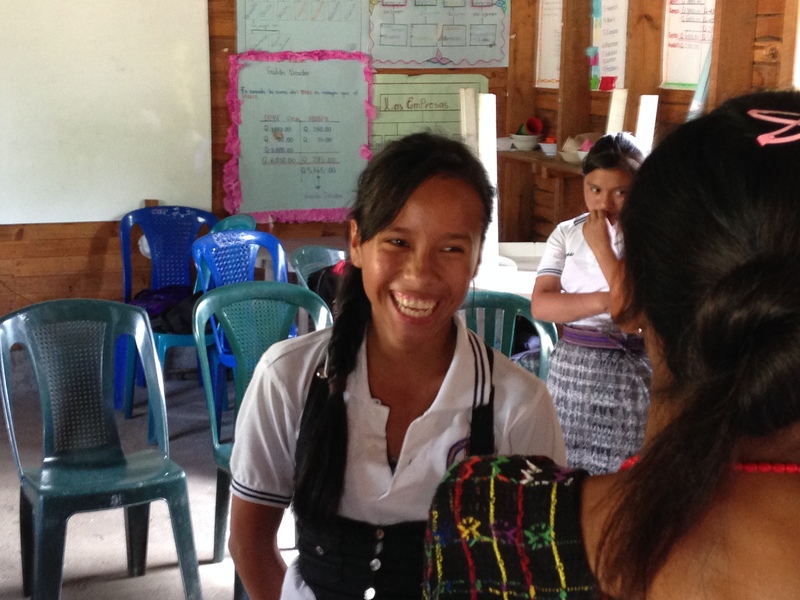 My friend explained to me that schools in Guatemala often teach students that in order to get ahead in life, they have to make a choice between a eurocentric school culture or their indigenous culture. As a result, she explained, it is not uncommon for youth who become more educated than their parents to assume an attitude of superiority, shunning their parents’ indigenous language and way of life. Forcing students to believe in this fictitious trade-off is cruel, and completely avoidable. Schools and youth programs can and should do just the opposite: encourage students to see the beauty, wisdom and knowledge in their own culture. 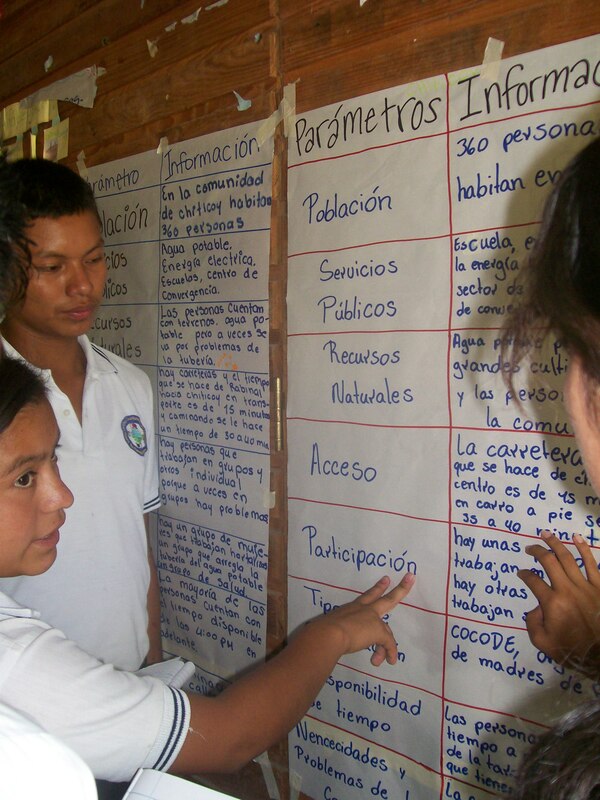 This is perhaps why students in the Voces y Manos program take on their community projects with such enthusiasm: VyM helps them see that the knowledge they already possess—learned from their parents, relatives, and community members—is the foundation for their success as students and community leaders. In the weeks ahead, Hector will learn to analyze data, use spreadsheets, and prepare a PowerPoint presentation. But these skills are secondary. The respect for community he describes is central. It will be exciting to watch as Hector translates his convictions into practice in the weeks ahead. 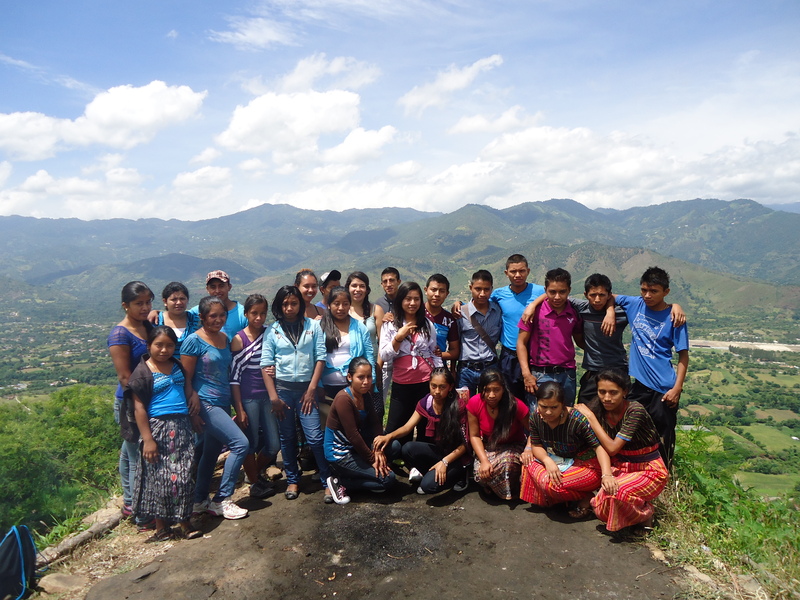 Two weeks ago, we started our summer program with a new cohort of 12 students. We will be working with these youth intensively over the course of the next eight weeks as they conduct community investigations, and develop projects to improve public health. Already, the program is off to an exhilarating start. 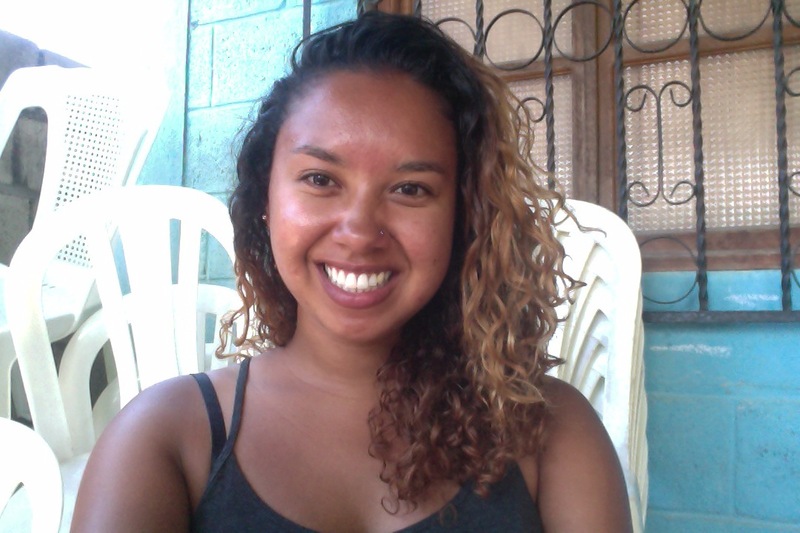 The most important new development: Macario Vasquez Reyes and Yenifer Valey Gomez (below), both graduates of Voces y Manos’s Scholarship Program have joined me in co-facilitating our youth workshops. 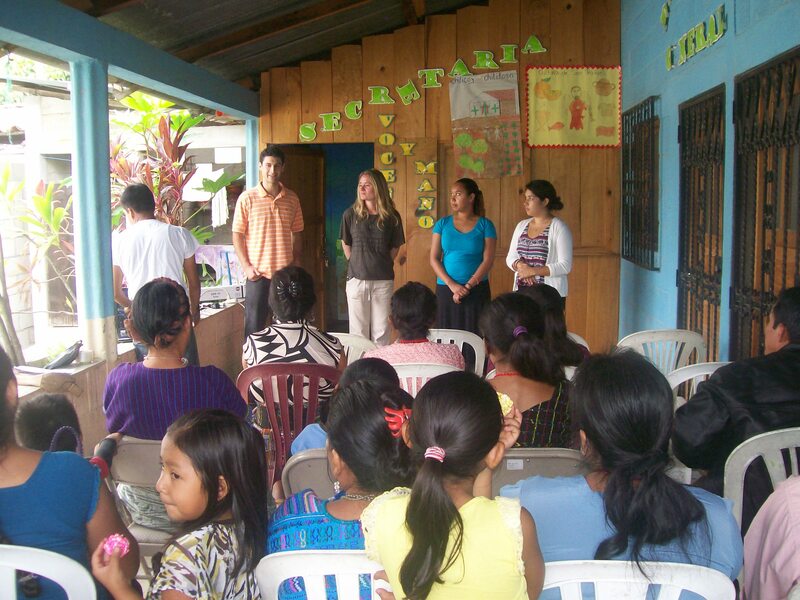 Involving Voces y Manos alumni as co-teachers has been one of our long-term goals, but it only became attainable this year when the Voces y Manos Fellowship Program was launched. 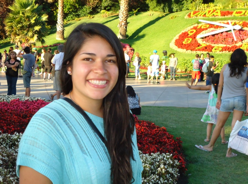 Aimed at fostering ongoing leadership development, the Voces y Manos Fellowship provides recent graduates of our program with a University scholarship and the opportunity to gain work experience by leading several Voces y Manos projects. 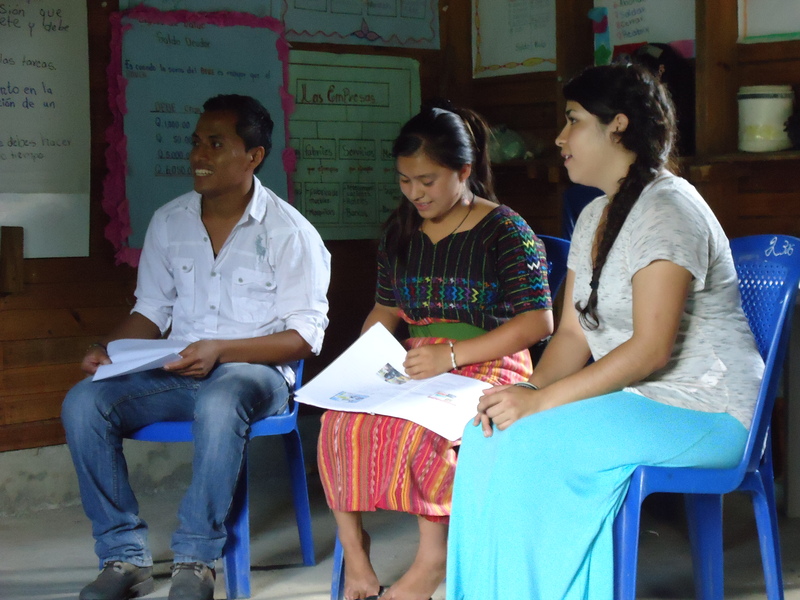 Macario and Yenifer are the first two recipients of this Fellowship, and they are already making their impact felt in the most positive of ways. In working with the incoming group of youth, Macario and Yenifer have shown an incredible ability to relate to and inspire students, in large part because of their shared backgrounds. Like the scholarship program newcomers, Macario and Yenifer have had to overcome numerous barriers– inflexible school policies, resource limitations, and geographic isolation–in order to graduate high school and attend college. Macario and Yenifer are also close in age to many of our students, having graduated from the same middle school as our students just four years ago. They share the challenges, hopes and dreams of our students and their families, and have already become inspiring role models. Prior to our first session, Macario, Yenifer and I made a point of visiting each the homeof each of our incoming student’s to explain the program to their parents. It was a joy to sit on the patio of our students’ homes and listen to Macario and Yenifer explain the program to parents. At times the conversation would transition from Spanish into Maya-Achi, and while I no longer could understand the words that were spoken, nodding heads and smiles on the faces of parents showed what mattered. 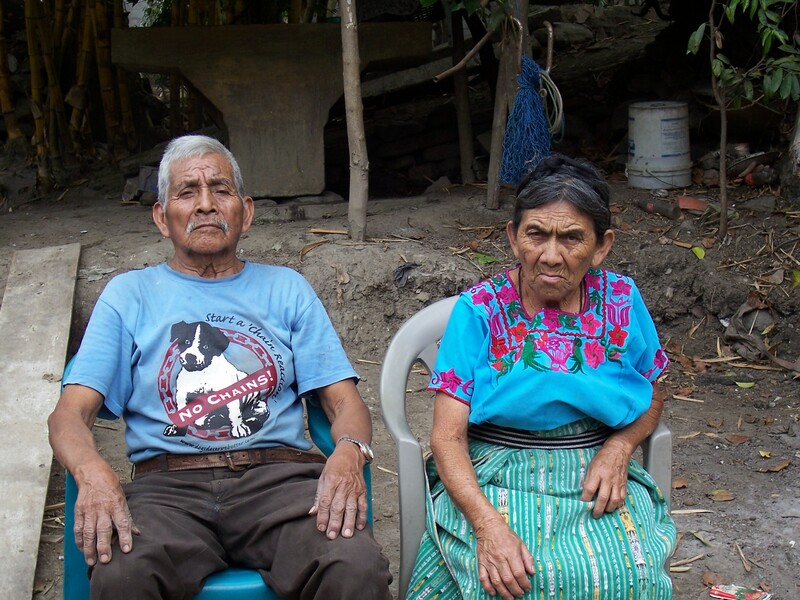 Through these home visits, Macario and Yenifer were building bridges to connect Voces y Manos to the families and communities we serve. 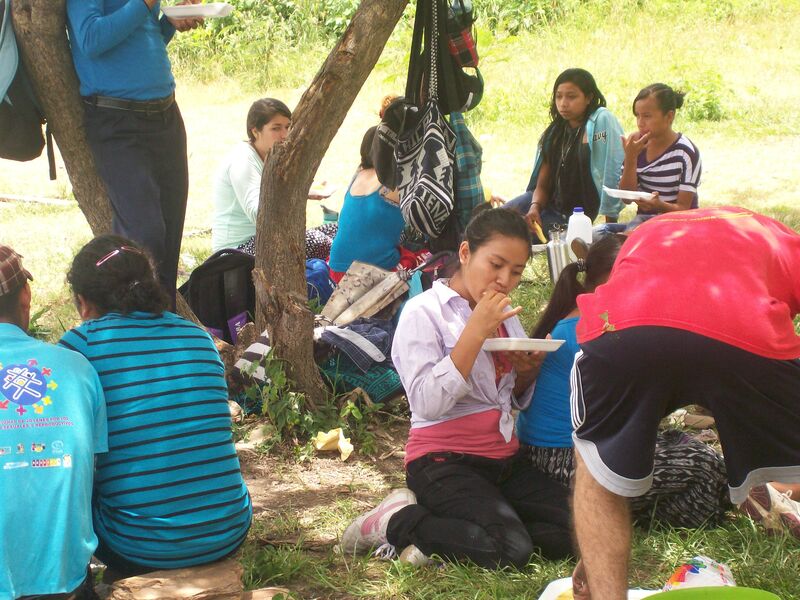 Now with a scholarship program that has leadership shared between the American and Guatemalan members of Voces y Manos, the strong relationships with the community that have always been the core of our program are stronger than ever.